A survey of drivers who have used a stretch of road with intelligent road studs suggests the vast majority of drivers want the scheme to be replicated across all British roads. Clearview Intelligence says 91% of those asked cited improved visibility on the six-mile (ten kilometre) stretch of the A38 in Derbyshire, with 77% feeling more confident driving at night. 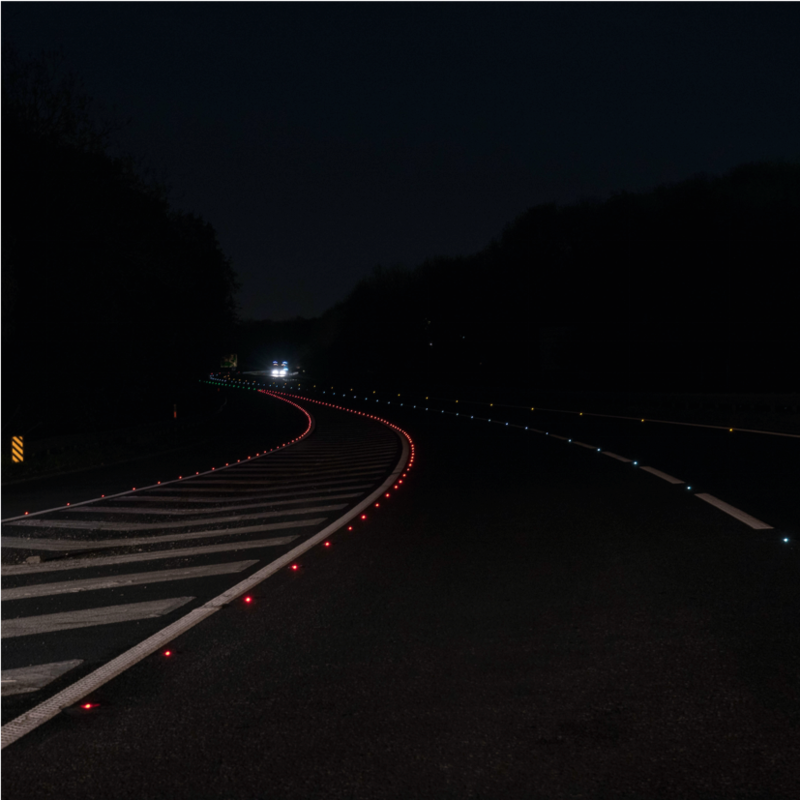 The company replaced traditional retro reflective road studs with its SolarLite Active Road Studs. WJ Group used high visibility lane marking and a high friction surface to minimise the risk of skidding. More than 700 drivers living near to the scheme have completed a survey regarding the improvements, with 87% of respondents now feeling ‘reasonably’ or ‘totally’ safe using the road, compared to just 28% before. Andy Salotti, Director of Solutions at Clearview Intelligence said, “From an industry perspective we have already had confirmation that this scheme has been successful with a win at last year’s Highways Awards. But it is important to remember that it is the opinion of the end user – the driver – that ultimately matters as every road improvement scheme is delivered for their benefit. Clearview says SolarLite Active Road Studs can be seen from up to 900 metres away and have an operational lifespan of up to 10 years – up to four times longer than retro reflective studs. It adds that, because they can be seen up to 10 times further away, they provide up to 10 times more reaction time for drivers. Therefore, whilst a driver travelling at 62mph would only have 3.2 seconds to react to a change in a road layout using traditional studs, the SolarLite alternative can offer more than 30 seconds’ reaction time.